Transform your classroom culture from one of passive knowledge consumption to one of active learning and student engagement. In this well-researched book, author Rebecca Stobaugh shares how to build a culture of thinking that emphasizes essential 21st century skills—from critical thinking and problem-solving to teamwork and creativity. Gain 50 teacher-tested instructional and student engagement strategies for nurturing students' cognitive development, and utilize the book’s Take Action activities to help you put the student engagement strategies to work in your classroom. Gain an understanding of the concepts of critical thinking and cognitive engagement, as well as the relationship between the two. Study Bloom’s revised taxonomy, the cognitive processes associated with its various levels, and how they relate to cognitive engagement in the classroom. 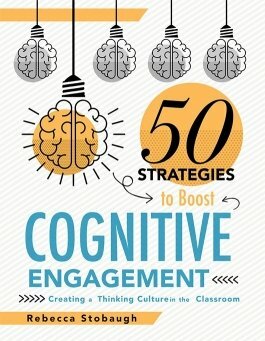 Access 50 teaching strategies for classroom engagement that will encourage the cognitive development of students and grow their critical thinking skills. Learn about three important aspects for sustaining classroom engagement—movement, collaboration, and media literacy—and how these connect with the 50 teaching strategies. Utilize effective teaching strategies and new knowledge of critical thinking and cognitive skills to build a culture of thinking in the classroom. Jim Bellanca, president, Illinois Consortium for 21st Century Schools.